For many patients, both young and old, filler treatments to the under eye area are a safe and effective alternative to surgery. Many patients are unhappy with the shadows and depressions that occur under the eyes. This can be due to genetics, but is also a common sign of aging. Dr. Greene is nationally renowned as one of the true experts with the tear trough, having performed thousands of treatments. Patients from all around the country seek his expertise for their tear trough treatments. 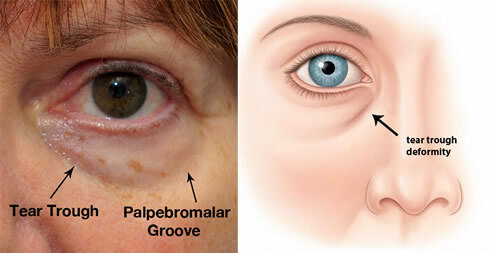 The tear trough, also known as a nasojugal groove, extends from the inner corner of the eye, following a semicircular arc and transitioning to the palpebromalar groove. A deep tear trough can create a shadow that is perceived as a dark circle below the eye. It also creates a division between the lower eyelid and cheek that is an early sign of aging around the eyes. Patients with deep tear troughs often complain that they look more tired and older than they really are. Patients often ask me - Do you use blunt a blunt cannula for the tear trough? 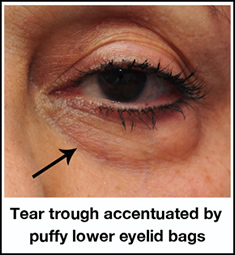 A tear trough is caused by tethering of the lower eyelid skin to the underlying facial bones. As aging leads to volume loss and tissue laxity in the lower eyelid, the tear trough becomes more prominent. The appearance of lower eyelid bags can accentuate a tear trough, making the shadow more visible. And while it is more common as patients age, even younger patients can have a tear trough deformity. While a tear trough deformity can be corrected surgically by repositioning fat in the lower eyelid, treatment with filler has become a popular alternative. Many patients prefer a non-invasive approach, in order to avoid the risks and potential complications of surgery. Treatment with a filler such as Restylane can provide a patient with a long-lasting natural result, often greater than one year, with minimal downtime. WHO IS A CANDIDATE FOR TEAR TROUGH FILLER TREATMENT? Patients who are good candidates often complain of a ‘hollow look’ or dark circles under they eyes; they may also point out enlarging fat pockets in the lower eyelids. Selecting appropriate patients for tear trough treatment requires expert judgment. Excellent candidates have good skin elasticity and adequate skin thickness. The position of the orbital rim to the tear trough is also an extremely important consideration. For these reasons, not everyone is a good candidate for treatment of the tear trough. However, Dr. Greene has found innovative ways to sometimes treat patients who are not ideal candidates. This sometimes involves staged treatments as well. 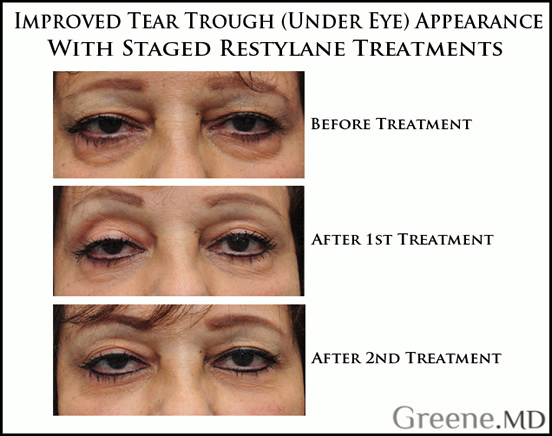 Restylane is an ideal filler choice for the tear trough for many reasons. It unique consistency creates a natural rejuvenation in the tear trough. It is also long-lasting, often greater than a year. And finally, since it is a hyaluronic acid filler, it can be broken down with hyaluronidase injection, if necessary. Belotero is another hyaluronic acid filler that can work well in the tear trough. Unfortunately, not all fillers are well suited for the tear trough. Juvederm exerts a very hydrophilic plumping effect under the eyes, creating a very conspicuous ‘puffy’ look that can persist for several months. And while many injectors have tried filling the tear trough with collagen, Radiesse, Artefill, and even silicone, these other filler materials have been associated with unwanted side effects and poor cosmetic outcomes. DO YOU USE A CANNULA FOR UNDER EYE INJECTIONS? Patients often ask me if I use a blunt cannula for my tear trough technique. I answer that I have always used a needle instead, for multiple reasons. In my opinion, the needle technique is more precise, as I am always in the correct plane, and I know exactly where I’m placing the filler. With a cannula, the filler is often placed in an incorrect plane (too superficial and not deep enough). In my practice, I often see patients treated elsewhere who had filler placed incorrectly using a cannula; this often creates puffy, lumpy filler below the tear trough. Here’s the advice I give patients if they prefer to be treated with a cannula: find someone who is VERY experienced with cannulas (as a lot of cannula users are not), who is also an expert with the under eye anatomy. Dr. Greene is one of the most experienced injectors in South Florida, and tear trough filler treatments make up a large part of his fillers practice. Filler treatments of the tear trough require a significant amount of skill and judgment. With poor judgment and unskilled technique, the complication rate is high and patient satisfaction is low. It is essential for patients to undergo treatment not only with an experienced injector, but also a practitioner skilled in tear trough treatments. Dr. Greene routinely sees patients who have been treated elsewhere and are unhappy with their tear trough treatments. Fortunately, these treatment outcomes can sometimes be revised and improved significantly. WHAT ELSE IS IMPORTANT TO KNOW PRIOR TO TREATMENT? 1)	Surprisingly, injections under the eyes are not painful. Patients are often anxious about their upcoming treatment, but are pleasantly surprised to find that there is virtually no discomfort. 2)	Mild bruising is common after filler treatment of the tear trough, but typically resolves within a week. Patients are advised not to undergo treatment if they have an important event around the corner. 3)	Most patients are pleased with the outcome of treatment, even if their results are subtle. 4)	Most patients only require one syringe of Restylane, but patients with very deep tear troughs may ultimately need multiple syringes. 5)	As with all filler treatments, it is essential that patients avoid aspirin, ibuprofen, or any other medication/supplement that may promote bleeding. Tear trough treatment is an office-based procedure that improves the appearance of the under eye area. Products most commonly used for these procedures are Restylane and Belotero, both hyaluronic acid fillers. Patients who seek under eye treatment often complain of dark circles under the eyes, a hollow look under the eyes, or fat pockets in the lower eyelids. Tear trough treatment helps to fill in shadows and depressions to create a more rejuvenated look to the lower eyelids and cheeks. HOW LONG DO THE RESULTS OF UNDER EYE TREATMENT LAST? The results of tear trough treatment vary from patient to patient. However, in experienced hands, the results should last around nine months. In many cases, the results last well over one year. WHAT ARE RESTYLANE AND BELOTERO? Restylane and Belotero are both comprised of hyaluronic acid gel. They are often used to treat facial wrinkles such as the nasolabial folds and fine lines. These two fillers are particularly well suited for the under eye area. IS THERE MUCH DISCOMFORT DURING UNDER EYE FILLER TREATMENT? Patients are surprised to find that there is almost no discomfort during treatment of the under eye area. Despite this, Dr. Greene still applies a topical anesthetic cream prior to treatment to eliminate any discomfort. WHAT IS THE EXPECTED RECOVERY AFTER UNDER EYE TREATMENT? Some minor swelling is expected after treatment. This is usually minor and resolves within a week. Some patients will also develop minor bruising that can usually be covered with makeup. Patients should avoid exercise for twenty-four hours after the procedure to minimize swelling. Otherwise, patients can resume work and normal activities. 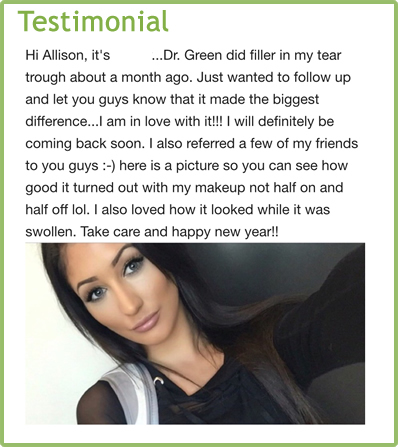 WHY CHOOSE DR. GREENE FOR MY UNDER EYE FILLER TREATMENT? Dr. Greene has administered thousands of facial filler treatments. He is also a national trainer for Allergan (the makers of Botox and Juvederm) and is recognized by his peers for his excellence and knowledge of facial fillers. He believes in natural results, and has pioneered a new approach to facial fillers. 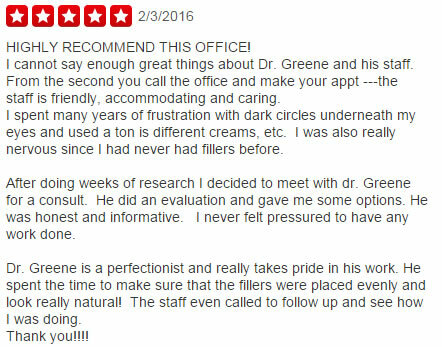 Dr. Greene’s dedication to providing exceptional results for his patients has elevated him to one of the top injectors in South Florida.